Cameras Downunder Gallery - Others/ALFAX Model-11, 127 camera. photo 2. ALFAX Model-11, 127 camera. photo 2. 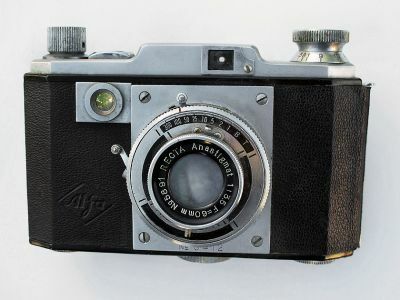 ALFAX Model-11, camera for 4x6.5cm exposures on 127 roll film, camera has a eye level finder, also waist level finder, embossed in the leather at the front is the Alfa Logo, very similar to the Agfa diamond. Lens: Recta Anastigmat f 3.5/60mm. very unusual camera, sort of Leica winding knob, but I have not worked out the meaning of the numbering on the winder knob, starting at no.4 to 10. There are no makings to the origin on the camera, Body no.412, Lens. no.5891. The camera seem to be made in Japan by Kimura Optical Works in Japan, ca.1940 ?